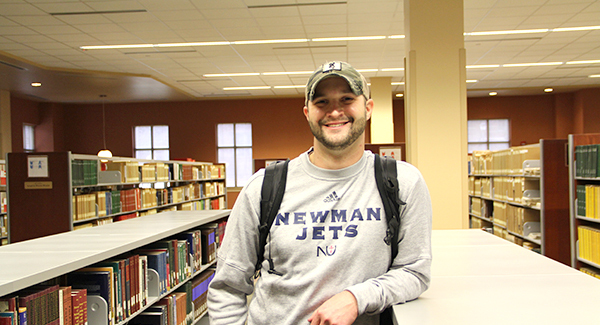 Newman senior Ryan Lee began his higher education journey at Newman University at the age of 27 after serving eight years in the Air Force. Lee joined the service at the age of 19 and was active duty serving in a security forces squadron. Lee said his untraditional education path has been made a little smoother because of Newman’s experienced staff and faculty. His GI Bill is the reason Lee is able to attend Newman University, and he said the speediness at which Newman filed his paperwork was instrumental in getting the payments sent in. “Financially, if I was not using my GI Bill, I would not be going to Newman,” explained Lee. “The reason I chose Newman was because it is a Yellow Ribbon school. The process of getting my paperwork done was pretty simple.” The U.S. Department of Veterans Affairs’ Yellow Ribbon program allows approved institutions of higher learning and the VA to partially or fully fund tuition and fee expenses that exceed the established thresholds under the Post-9/11 GI Bill. 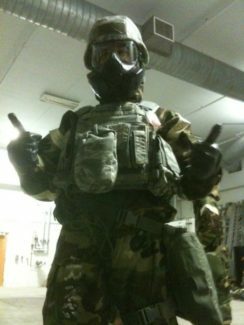 Lee poses in his military gear. Lee added the amount of support he has received from Newman faculty has played a large role in his collegiate success. Part of that hectic life involves working for the Department of the Air Force as a federal police officer. Because of his passion for service, Lee chose to pursue a criminal justice major. He said the education he is experiencing at Newman has reinforced what he has already learned in his current career and during his time in the military. Lee said although he has a wide range of knowledge in the security field, he is also learning a great deal during his studies at Newman. “A lot of classes in my degree have touched base on things that I have already learned or am currently experiencing. As a police officer in the Department of the Air Force, I hold multiple responsibilities. At work, I hold the title of police officer, security guard, 911 dispatcher, corrections officer and customs inspector. He added that attending Newman as someone who was not raised in the Catholic religion has allowed him to step out of his box a little. 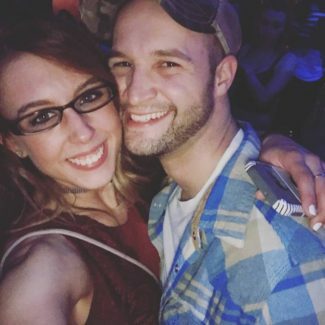 Lee with his fiancé, Rebecca. Lee said he is excited to graduate in May and is planning on switching gears from military law enforcement to civilian. He is currently interning with the Wichita Police Department with the goal of becoming a police officer. Outside of the support he receives from staff and faculty at Newman, Lee said he has had two major supporters in his higher education journey. “My dad and my fiancé, Rebecca. My dad has always been one to push me to better myself, especially in the education field. And Rebecca is constantly hounding me to make sure I make it to class and get my homework done on time. She knows how important this degree is and even though we are in the process of remodeling my house, raising her 5-year-old, and trying to plan a wedding, she is constantly there pushing me.